Happy New Year! People often ask us, “How do you celebrate Christmas in Japan?” Obviously, the entire atmosphere surrounding Christmas is different here. There is a lot of emphasis on the holiday, but little understanding about the meaning of the day. For this reason, Christmas is one of the best times of the year to tell people about Jesus. So, even though Christmas is long gone, we would like to report on our many Christmas activities last December. Luke’s kindergarten held a huge Christmas program with all of the classes presenting a different drama. Luke’s class told the Christmas story and Luke was one of the angels. In the 30-minute production, each child had a speaking part and some even sang solos. Not bad for a group of 4 & 5-year olds! Luke’s line was “Kono kata koso, Shu Kirisuto desu” (“He is Christ the Lord” Luke 2:11). He got it almost perfect, and we were thrilled that God was able to use him to proclaim the birth of our Lord to the largely non-Christian audience. For their last lesson of the year, Chris invited her English students over to our place for a time of Christmas celebration and fun. This was a chance to meet and share outside of the classroom setting. 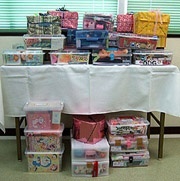 This year SIBC participated in what is called the Gift Box Program. Similar to the Samaritan’s Purse in the States, we partnered with a ministry here in Japan to share the love of Christ by putting together gift boxes for needy children. In all, the church members assembled 29 boxes of goodies that will be distributed to orphans in China, Myanmar, Cambodia and the Philippines. This seemed to be a rewarding activity, especially for the Japanese believers. Overseas Christians have been such a blessing to the Church in Japan over the years, so it was nice for the Christians here to be the ones being a blessing. On December 17th the church hosted a Christmas Coffee House outreach. Through live music, a Christmas song sing-along, testimonies and a short message, we were able to celebrate the real meaning of Christmas while sipping coffee from the local Starbucks. The turnout was a little low, but for a couple of people in attendance, this was their first time to ever be in a church. We had a wonderful time and the Lord blessed the event very much. Since Christmas fell on a Sunday this year, it was a wonderful opportunity for us to celebrate together as a church family. 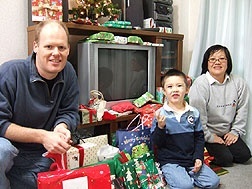 In Japan, most families, even Christian families, don’t view Christmas as a family day like we do in the West. For this reason, the church members were more than happy to stick around for an afternoon of food, singing, fellowship and Christmas fun. The highlight of the potluck lunch was going to be the turkey that Chris was planning to prepare. Turkey is rare in Japan, mostly because Japanese ovens are too small to cook even a tiny bird. Well, with the new oven roaster that she picked up in the States, Chris was going to treat the Japanese to a “traditional” holiday meal. However, when we went to Costco (yes, we have Costco in Japan!) to pick up the turkey, they were completely SOLD OUT! We were so disappointed. This would have been the first time that many of the people would have ever had turkey. But with our turkey plans down the tube, we had to turn to Plan B: Kentucky Fried Chicken. This might sound strange to you, but this is actually a very common meal for Japanese on Christmas. KFC begins taking orders in mid-November so that people can pick up their special KFC Christmas Family Packs for dinner after work on December 25th. So, although the foreigners at SIBC missed out on a taste from home, the Japanese were probably more than happy to spend Christmas with the Colonel! When all of the church activities were over, we were finally able to come home and spend a quiet Christmas evening together as a family. Of course, Luke was excited about all of the presents that had come from friends and family overseas. At five years old, Luke is now very aware that this is one of the many “blessings” of Christmas. We then sang “Happy Birthday” to Jesus and ate the birthday cake that Chris makes every year. It was a nice ending to a good Christmas season. 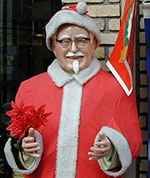 As you can see, our Christmas in Japan may not be too different from yours (except for KFC!) While every culture may add a little twist to how the day is celebrated, in the end we are all celebrating the same thing: “A Savior has been born to you, he is Christ the Lord.” Please continue to pray for us as we desire to proclaim to the people of Osaka the wonderful news of the birth of Jesus Christ. May the Lord richly bless you in 2006.